The great thing about Belize is that, most of the time, you do not need to choose between nature, culture and adventure, as most of the country’s sites harmonise the three in a perfectly balanced way that provides a daily dose of excitement and wonder. Whether you choose to explore the many ancient Maya temples or caves, take a bus ride with the locals across the country, join a drumming class on the beach, or take a dive in the world-renowned Great Blue Hole, Belize will simply never cease to amaze you! And when it’s time to take it easy, retreat to the idyllic cayes and take the time to live life the Belizean way: slowly! Enjoy the simple pleasures provided by the warm sand, the bright sun, and the beautiful sea, take a leisurely stroll around the island, and mingle with the locals and other visitors – that’s what the cayes are all about! 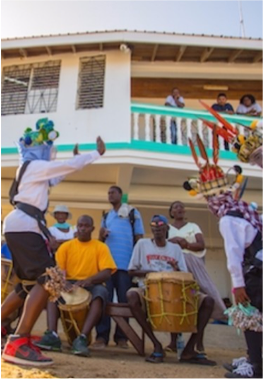 For an authentic feel of Belize's heartbeat, head over to Dangriga and Hopkins, the birthplace of the world famous Punta Rock and Paranda music genres, where music is not only at the heart of every celebration, it is also a language. In the village of Hopkins, the atmosphere is much more laid back and the focus is on the music. 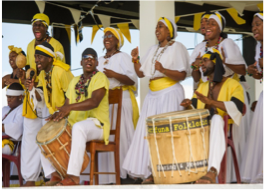 As a result, it is not rare to hear a group of people of all ages singing and dancing together on the beach, to the beat of the Garifuna drums. The local Garifuna people love for visitors to join in: strumming a chord, holding a beat or simply singing along is the best way to make friends. At night, the island takes a whole new atmosphere where the laziness of the day is replaced by a vibrant party vibe, with tourists filling the many bars, restaurants and beach parties. Cocktails and karaoke bars, live music, outdoor cinema, or a quiet meal, Caye Caulker has it all! A collection of ancient Maya artefacts, documents, memorabilia, old stamps, retracing the country’s cultural and historical heritage, and housed in a former jailhouse. The people there are of a specific ethnic group named Garifuna and resulting from the association of indigenous Amerindians from South Americaand West African slaves. The Garifuna first appeared on St Vincent and travelled through Honduras before settling here in the 1800s, which explains why most Gariganu (plural form of Garifuna) people have Latino surnames. Considered by most as Belize's main cultural hub, Dangriga is the Capital of the Stann Creek District and an urban jungle that vibrates to the beat of its year round festivals, gravitating around the celebration of its distinct and rich heritage, such as during the National Garifuna Day, taking place on November 19th. Belize’s port city is a busy mix of ethnicities where Caribbean and Colonial-era architecture, cultural and historical centres meet. As the national business epicentre, the former capital is home to Belize’s largest hotels, as well as the Museum of Belize, and the country’s only cruise passenger terminal. The city is a great place to catch a domestic flight or water taxi to one of the neighbouring cayes. 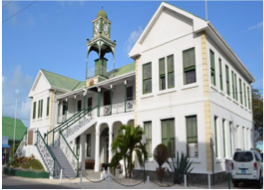 Originally housing the Government House, the building was renamed after the relocation of the government to Belmopan that followed Hurricane Hattie in 1961, and used as a venue for social events as well as a guest house for public figures, such as Queen Elizabeth. The place is now open to the public. Famous for its relaxed vibes, this island is the place where all kinds of travellers meet to enjoy the simplest things in life. Popular with backpackers and budget-minded travellers, Caye Caulker caters for all budgets, whether you're after a dorm, a guesthouse, or a bit more opulence. An hour's boat ride away from Belize City, or 15 minutes from San Pedro, Ambergris Caye, and amongst many travellers' favourite spots is Caye Caulker, a small island with beautiful beaches, turquoise water, and coconut rum! Although the original building burnt down in 1918, the 1926 reconstruction of the edifice matched the New Orleans style of the previous one, featuring filigreed iron stairs, balcony rails, and a four-sided clock. 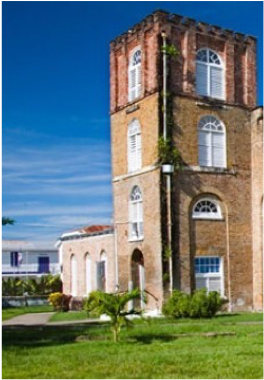 Central America’s oldest Anglican Church was built with bricks that were shipped from England in 1812, and saw the crowning of four Kings of the Mosquito Coast from 1815 to 1845.
click here to download everything about Belize! With one of the lowest population densities in the world (ranked 209 out of 239 countries, with just under 400,000 inhabitants spread over 22,960 square kilometres), it's not just for its Mayan heritage that Belize is famous for, but its wild life conservation programs and sanctuaries are some of the most exemplary and proficient ones in the world. One of Belize's most famous wildlife conservation institution is the Cockscomb Basin Wildlife Sanctuary, also known as the Jaguar Preserve, near Dangriga. Spreading over 128,000 acres of abundant jungle and surrounded by the Cockscomb Mountains, the sanctuary plays a major part in the protection of jaguars and of two major river system, andoffers one of the country's most extensive jungle hiking trails, providing unique opportunities to spot and observe the local fauna and flora in their natural environment. With 5,468 acres of wetlands that are home to endangered species such as the Yucatan Black Howler monkey, Baird's Tapir and Swietenia Macrophylla Mahogany, the sanctuary is ranked as one of the priority zones by the National Protected Area Policy and System Plan Project. A great site for hiking, caving and fishing, topped up with a soothing dip in the park’s hot springs. Nestled in the Mountain Pine Ridge area, this wet cave is great for canoeing and is dotted with ancient Maya ceramics and calcified skeletons. The site was home to the interesting discovery of a necklace made of perforated animal finger bones and a bone that displayed the carving of a seated figure with its legs facing forward and hands across its waist. Spread over 20 miles, the sanctuary was created in 1985 by a group of local farmers in an effort to protect the then-critically endangered howler monkey. The site is now home to a thousand howler monkeys, birds and other mammals, providing a loud but exciting experience! Named after a local spiritual and herbal healer, the Noj Kaax Meen Elijio Panti National Park boasts not only an impressive wildlife, but also ancient mysteries, that together compose the lush 16,000 acres of landscape and its preserved jungles, medicinal trails, streams and rivers, as well as its Ancient Maya ceremonial caving system, which also features ancient artefacts. The village features a few tours and hikes that take you through the local flora and fauna, and through which you may spot wildlife such as tarantulas, crocodiles, snakes, howler monkeys, toucans, oropendolas and, if you’re lucky, a deer, tapir, or even a jaguar. This trail teaches visitors about the virtues of the plants traditionally used by the Maya for medicinal purposes, such as the red gumbo-limbo. Composed waterfalls and fresh-water pools made of granite rocks and ledges, you will find this scenic site in the beautiful Mountain Pine Ridge Forest Reserve. The perfect spot for a picnic and a swim. The 29 acres of tropical savannah are home to 150 species of rehabilitated, orphaned and rescued wildlife of Belize, including jaguars, tapirs, manatees, spider monkeys, keel-bill toucans, and scarlet macaws. With so many natural reserves, parks, and Mayan sites to explore, and rare wildlife to discover, Belize is a one-of-a-kind wildlife gem and a nature lover’s paradise. And whilst it may be tricky for you to fit every single hike in your holiday plans, rest assured that each of them will be the source of unique memories you shall carry with you forever, whether you opt for a day tour or a full-on four days trek. Protecting the fauna and flora is a matter that the country takes very seriously and one that gives the chance to travellers to explore a practically untouched and undisturbed form of wildlife in a not only respectful but instructive manner. If you fancy discovering the country's wildlife without the strain of the trek, head to the Belize Zoo, an internationally acclaimed one that started as a refuge for wild animals and that was featured in many documentaries. In fact, the first ever film on Belize wildlife was made here, by award-winning British documentary filmmaker Richard Foster. The National Park side of Bacalar Chico is an 11,145 acres large reserve resting on the Yucatan’s bedrock limestone, as well as relict reef, and is one of the best examples of healthy littoral forests. Hikers will enjoy exploring the land for a chance of encountering one of the 36 reptile species and 31 mammal species living within the reserve. The centre has a collection of jarred “preserved” insect and reptile species for you to get acquainted with some of the local wildlife, with the assistance of a naturalist guide. Or go to the screened-in butterfly breeding centre where you’ll get a chance to spot some truly stunning butterfly species. This 16,400 acres-large sanctuary boasts 3,000 acres of swamp, lagoons and marsh, making it an ideal bird-watching location. Or take a canoe to explore the wetlands and get closer to the communities of iguanas, crocodiles, coatis, turtles, and jabiru stork – the largest flying bird in Central and South America, with a wingspan of up to 12 feet. The country’s smallest national park takes its name from the giant Guanacaste trees rising at a height of more than a hundred feet, and that are home to beautiful tropical birds such as the smoky brown woodpecker, black-headed trogons, red-lored parrots and white-breasted wood wrens. In San Ignacio, this important project aims to preserve and redevelop the endangered population of Green Iguana species in Belize, by sharing information about the animal as well as raising awareness of the threat of its extinction, through a series of interactive exhibits and educational programs. This 300,000 aces of preserved pine forest in southwestern Belize is home to natural wonders such as the country’s largest waterfalls and the Rio Frio Cave, the country’s quarter-mile-long cave system. Explore the park by foot, bike, or horseback for a chance to spot some stunning Belizean wildlife such as cougars, jaguars, tapirs, and ocelots. A short hike through the national park takes you to one of the area’s largest waterfalls, one that features a deep limestone pool where you can cool off after your walk, and take the time to take in the beauty of this site. The park features a natural turquoise pool that is part of a river system and that offers a nice cooling dip in the middle of lush vegetation. For the adventurous, the park is also home to a cave that requires a guide to be explored. Many jungle resorts have guided or self-guided trails made of well-defined path enabling hikers to discreetly observe the local wildlife, with the help of unobtrusive signage highlighting types of plants, trees and points of interest. Some resorts, such as the Don Elijio National Park (named after Maya Shaman Elijio Panti), even carry iguana or butterfly breeding programs that travellers can discover through nature trails purposely created to outline such program. Belize’s hidden gems are often best accessed by foot, and horseback riding is a fun alternative to exploring the natural beauties tucked in the country’s lush vegetation. You will find many tour operators and even resorts organising horseback riding trips through the jungle or to Mayan sites such as Cahal Pech, El Pilar, or Xunantunich. Located between Mullins River watershed to the north and Stann Creek watershed to the south, this 1,639 acres large park sits on Santa Rosa metasedimentary rocks, and boasts a beautiful tropical evergreen forest, as well as a stunning waterfall. Located north of San Jose village, the reserve is known for being one of Central America’s largest protected areas of rainforest, as well as for its Karst terrain, composed of irregular limestone, sinkholes (up to 800 feet deep), fissures, underground streams and caves, and a forest elevation ranging from 1,000 to 3,000 feet. Accessible via a two-mile hike or by four-wheel drive, this 500-foot waterfall and its natural pool make the perfect spot for a hike and picnic day-trip. Located in southern Belize, next to the Sittee River Forest Reserve, this park spreads over 7,087 acres of low and highlands, and is a comnecting region between the coast and the Maya Mountains. Some of the park’s stunning waterfalls include the Bocawina Falls, Three Sisters Falls and Antelope Falls, and involve hikes of various length and difficulty. 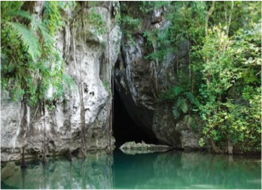 Located within the Mountain Pine Ridge Forest Reserve, this quarter-mile-long cave network is regarded as one of Belize’s best caving systems, and features waterfalls, fresh-water pools, and stalactite formations. You will find the country’s highest waterfall in a 1,290 acres-large designated monument area located at the heart of the Mountain Pine Ridge Forest Reserve, an hour and a half from San Ignacio. Falling from a height of 1,600 feet, the waterfall is also believed to be the highest in the whole of the Central American region. The stunning views and refreshing dip are the ultimate reward to your hike. Located 18 miles inland from Punta Gorda, near the Cockscomb Basin Jaguar Preserve, Payne’s Creek, and the Scarlet Macaw breeding area at Red Bank, and provides a refreshing dip and beautiful views when inland. Located at a 45 minutes-drive from San Ignacio, this magical site mixes wildlife and adventure, vegetation, and geology, combining to offer the experience of a lifetime. The tour starts with a 45-minute hike through the beautiful Tapir Mountain Nature Reserve, leading you to a crystal-clear stream flowing from the opening of the cave. Located in the Cayo District, a short walk from the present-day Cahal Pech town, in San Ignacio, this site was once a ceremonial centre featuring palaces, temples and a ball court, and now offers stunning panoramic vistas of San Ignacio and the Belize River Valley. The Maya site is accessible by boat, departing from Orange Walk and taking you through the New River which, with its abundant wildlife, is a tour in itself (expect to spot monkeys, snail kites, jacana, morelet’s crocodile and iguanas). Join one of the daily tours taking you through the Caves Branch River, home to caves that the ancient Maya population considered as sacred. During the Maya Classic Period, this site served as a trading hub between the Caribbean coast and the Maya centres located inland, and is home to the famous Jade Head, a 10 pounds-heavy carving of the Maya sun god Kinich Ahau, and the largest carved jade object in any of the region’s Mayan sites. Located in the Bay of Chetumal, across from Corozal Town, this is the only site in Belize that is situated on the coast, and was the first Maya trading centre to be built on the seaside, in 50 BC. Traders would reach the site by canoeing from the coast, the Rio Hondo, or the New River, through an extensive canal system built by the Maya people, whose expertise can also be found in the impressive raised-field agriculture structures. Located near San Pedro Columbia in the Toledo District, this site is different in the fact that it was built using no mortar, but by carefully cutting each stone to fit the adjoining one. Built in the Late Classic period, Lubaantun is southern Belize’s largest ceremonial centre, with fourteen major structures that gathered around five main plazas. Located in the Cayo District, atop a hill overlooking the Mopan River, this major ceremonial site was built on a natural limestone ridge during the Classic Period, and is composed of more than 25 temples and palaces, gathered around four plazas. Three times larger than Xunantunich, this isolated Maya site was occupied between 800 BC and 1000 AD, and counted over 20,000 inhabitants. El Pilar is still being excavated, revealing common homes that show visitors the living conditions of “regular” Maya populations. Located at the heart of the Chiquibul Forest Reserve, in the Cayo District’s Maya Mountains, this site impresses not only by its size (25,000 acres), but also by its complex city planning, acoustics-conscious plaza, and agricultural field system. Located in the Toledo District, near Indian Creek, this site is famous for its numerous stelae, and takes its name from the longest one found here. With a length of 30 feet, it is also the longest stelae discovered in the country, as well as being one of the tallest in the Mayan world. Located just outside of Corozal and immortalising the Mestizos’ birthplace, this Mayan site dates back to 1500 BC and was one of the area’s major trading hubs. Climb up the main temple to enjoy the panoramic vistas. Inland, the great river network, once the country's main way of transportation and commerce, is the perfect opportunity for some river tubing, kayaking or canoeing, a refreshing way to discover the country at its heart and come across tropical birds and huge iguanas (often plunging into the water after falling asleep on a branch). For canoe enthusiasts, Belize holds a yearly Ruta Maya Canoe Race, beginning at San Ignacio (near the Guatemala border) and running through various villages such as Banana Bank and Double Head Cabbage before finishing in Belize City's Haulover Creek, in the Caribbean Sea. 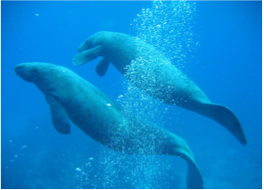 Established in 1996, this site’s Marine Reserve and National Park constitute one of the seven reserve zones that compose Belize’s World Heritage Site. The Marine Reserve side is located at the Mesoamerican Barrier Reef system’s most northern point and stretches over 15,530 acres. Great for both snorkelling and diving, the area is home to the likes of Horse Eye Jacks and Black Groupers, amongst other colourful marine life. Locate at the southernmost end of Belize, this marine reserve boasts one of the Caribbean’s most impressive marine biodiversity, and was established as a National Reserve in 1993. Glover’s Reef Atoll stretches over 35 kilometres in length, 7.5 kilometres in width, and has a circumference of about 200 kilometres, with depths ranging from 300 to 1,000 kilometres. A beautiful wall dive featuring a deep drop-off after which it is named, this site is great for spotting rays, barracudas, and turtles. This beautiful 15 acres-large caye is a quieter spot with stunning tropical beach settings with a beautiful reef located a short swim away, ideal for snorkelling and diving. With its steep drop-offs, the atoll is reputed for offering great wall dives that are adapted to all levels of experience, and is also home to the 1985 cargo boat shipwreck the Sayonara. The Mopan River, flowing from the Maya Mountain in Guatemala and joining the Macal River to form the Belize River are part of a network that was once used as the country's main mean of transportation and commerce, before roads were built. Keen divers and snorkelers should not miss this opportunity to visit the world famous Great Blue Hole, situated 70 kilometres away from the coast, at the heart of the Lighthouse reef. Part of the Belize Barrier Reef Reserve System and declared a UNESCO World Heritage Site in 1996, this giant submarine sinkhole, originally a limestone cave born around 150 000 years ago, was once declared by Jacques-Yves Cousteau as "one of the top ten dive sites in the world". This diver’s hotspot is found at the Turneffe Atoll’s most southern point, and boasts one of the country’s best wall dives, with depths ranging from 60 to 100 feet. Expect to spot large groups of eagle rays, as well as large Gorgonian fan corals, hammerheads, mantas. Starting at just 35 feet, this impressive free-fall dive is Lighthouse Reef’s best site, and bursts with exciting coral and sea life, including sea turtles and spotted eagle rays. Composed of metres-large boulders that create an ideal habitat for starfish, lobsters, eels, as well as Elk Horn and Staghorn coral, this Ambergris Caye site is a great snorkelling spot due to its shallow waters and visibility. SNUBA and sea trek tours are also available. Part of the Hol Chan Marine Reserve located on Ambergris Caye, this 1,280 acres protected area is a splendid snorkelling location to swim side by side with turtles, stingrays, and nurse sharks. Relax on river tube down many beautiful stretches of water that are well worth discovering. Although hidden coral heads may make navigation somewhat challenging, sailing around the Belizean atolls promises to be an unforgettable and exciting experience. But if you fancy exploring the idyllic tropical cayes without the worry of sailing your own boat, simply charter a boat and let the local pros do the work. You’re on holiday, after all! Located on the west side of Glover’s Reef Atoll, this site features one of the world’s best Elkhorn coral formations and, with depth ranging from 25 to 70 feet, offers a great beginner-friendly dive. Spreading over 13,632 acres of marine waters, this reserve’s name translates as “Little Channel”, in Maya, and takes its name from the deep cut found in the reef off Ambergris Caye. Locate 4 miles south of San Pedro, Belize’s first reserve was legislated in 1987, and is divided in four zones: Coral Reef, Sea Grass Beds, Mangroves, Shark Ray Alley. Located about 75 kilometres east of Punta Gorda, at the southernmost tip of the Belize Barrier Reef, this reserve encompasses 38,595 acres of healthy marine life and boasts one of the most authentic examples of the country’s amazing coral biodiversity. With a cliff falling at 130 feet and, after a narrow shelf, extending to a steep 350 feet descent, this site requires a certain level of experience to be enjoyed, but is said to provide an unforgettable dive that you’ll want to come back to. Snorkelers and kayakers will also enjoy exploring the area.